Broadening its footprint as an OEM, JA Engineering introduced its first ever in-house designed continuous miner at Electra Mining 2016 - the Wildcat JAE42 CM. According to JAE, the Wildcat is designed to meet the unique hard cutting conditions in South African coal mines. The company says it intently listened to its customer's needs and requirements and incorporated these specifications into the design. The Wildcat JAE42 continuous miner was launched at the recent Electra Mining Africa exhibition. The Wildcat, which is 90 % locally manufactured and procured, has a mass of 110 ton and a total installed power of 828 kW. The minimum/maximum cutting height is 2,20 m to 3,95 m (short barrel cylinder) and 2,20 m to 4,70 m (long barrel cylinder). JA Engineering has more than 29 years of experience as a leading manufacturing engineering company in the mining industry. 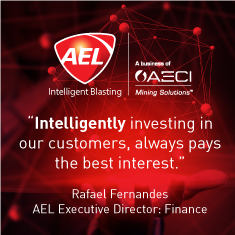 The company was established in 1987 by the Alexander family to provide the South African mining industry with alternative aftermarket support through exceptional reverse engineering solutions. It was also during this time that the company established itself as an Original Equipment Manufacturer (OEM) in the design of battery scoops for the South African coal mining industry. The company has three major aftermarket parts and service centres located in South Africa, namely Jet Park in Boksburg, Gauteng, Vryheid in Kwazulu-Natal and Middelburg in Mpumalanga. Abroad, JA Engineering Australia has an established facility that provides mechanical engineering, gear case design and manufacturing, as well as refurbishment of mining equipment to the coal mining industry.